Thunderbolt Patterson | Crockett Foundation - Tag In & Help Out! The standing invitation does not sound that unusual until you remember that those potential guests were all larger than life characters. 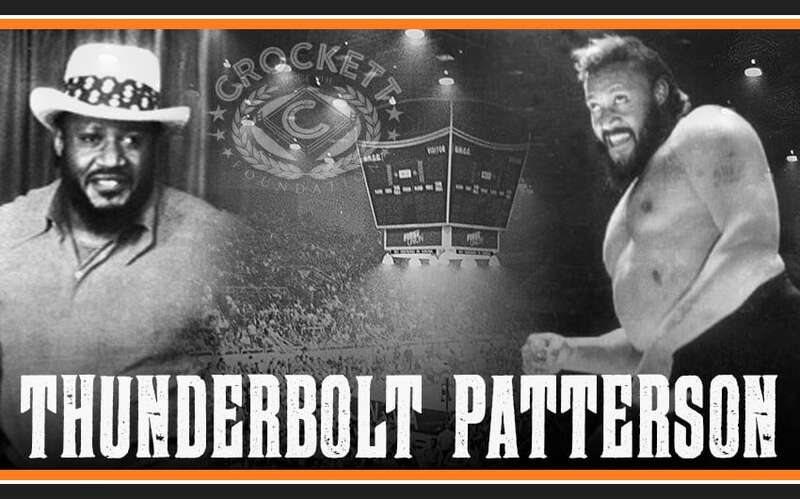 Ric Flair, Johnny Valentine, Wahoo McDaniel, but the one that comes to mind is Thunderbolt Patterson. At that time T-Bolt was just passing through the Carolinas and took Jim up on his dinner offer. For those of you that don’t know Thunderbolt Patterson, he was a big guy and great on the mic but he was also very nice and was down for anything the kids were doing including playing badminton. Bolt showed up for dinner in his Sunday best. He looked awesome in his yellow floral polyester shirt and yellow polyester pants in the most epic 70’s fashion style. This outfit was topped off with boots with 3” heels and a fedora with a feather in it which made the entire outfit that much more amazing. So you would think that when a badminton game fired up in the backyard that TB would have sat that out or at least taken his shoes off but no……he played like a champ and we loved it. He along with several other wrestlers there that evening attempted to teach us badminton wrestling style. As they body slammed us out of the way to get that point, the neighbors started pulling up lawn chairs to watch these huge men, some of which were dressed to the nines, take down a bunch of kids as though it was the Olympic Finals. T-Bolt never missed a beat and never hit the ground. We watched in awe as he played badminton while the hat stayed on. It was so incredible that we began to whisper amongst ourselves that the hat had to be glued on. I don’t remember who won or lost which probably means we lost but I do remember Thunderbolt Patterson making that Sunday one of the best and most memorable Sundays of my young life. He retired in 1993 but not before he went on to become the Brass Knuckles Champ in several states and returned to WCW briefly to take on Ole Anderson in the classic “If you move. Just move.” Promo. He was also the first wrestler double-crossed by the 4 Horsemen. He is now the executive director for Athletes Supporting Kids, he now runs a foster home for troubled teenage boys in southwest Atlanta. A normal day usually lasts 12 to 16 hours for the former wrestler who cooks, cleans and does whatever he can to keep these kids from falling on the wrong side of the law. He had a heart of gold then and still does to this day!